ARE THEY ALL RETARDED OVER THERE??? A good buddy of mine from my high-stakes gambling days is living in Japan right now. He sent me this pic (above) of the rinse cups his Japanese dentist uses. Jesus Japan, is it that hard to write a simple phrase???? You can’t hire a person who speaks English to write the copy for your ‘American’-style cups???? This is why I will never buy a Toyota. “Let’s Brushing?” ARE YOU KIDDING ME???? LET’S BRUSHING????? 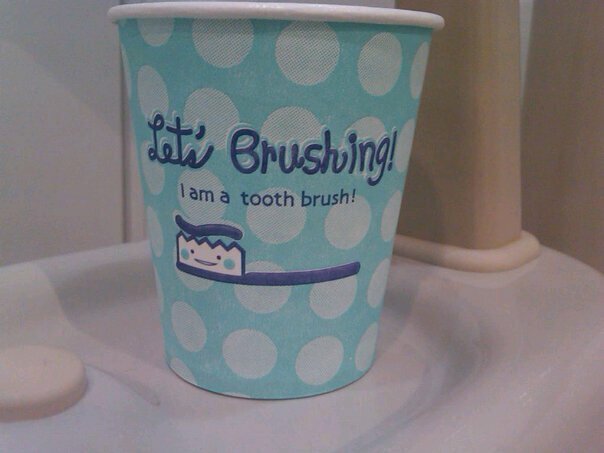 I would rather kill myself with a water pick than drink out of a cup that says ‘LET’S BRUSHING!’ And then, ‘I am a toothbrush.’ I AM A TOOTHBRUSH???? ARE YOU PEOPLE BABIES????? I MEAN COME ON OF COURSE IT’S A TOOTH BRUSH!!! Haven’t you people ever heard of SHOW DON’T TELL???? Oh and nice flaccid expression on that gay-wad brush. That thing has about as much emotion as Japanese people. Again, I have mad respect for the amazing, incredible Asian cultures, I just wished they spent less time building cutting-edge robots and more time checking their grammar. Enter your email address to subscribe to MarkMarcMark and receive notifications of new posts by email. NEW PROMOTIONS @ MARK MARC MARK = DEALS!